Microbes and fungi play important roles in ecological processes, and several Wyoming ecologists include these groups in their research. The Departments of Botany and Ecosystem Science and Management currently have strengths in fungal and microbial biology, and the Department of Molecular Biology has extensive facilities and expertise for microbiology. 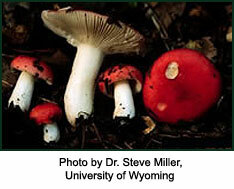 The Solheim Mycological Herbarium provides resources in fungal systematics and biogeography.